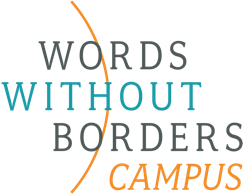 The goal of WWB Campus, according to its beta-version website, is “to create a virtual learning space without borders, fostering meaningful cross-cultural understandings and inspiring a lifelong interest in international literature.” And, apparently, to turn some of its twelve years worth of stories, poems, and essays into content modules that can be used in middle, high school, and university classrooms. Right now, the site has three countries in focus: China, Mexico, and Egypt. The Egypt section is introduced by scholar-translator Chip Rossetti, who gives a very brief overview of the country, its history, and its literature. The site then groups its Egyptian literary offerings under the headings “mothers,” “revolution,” “leaving home,” and “friendship.” All of the works previously appeared on Words Without Borders — a limiting factor — and all include some context and teaching ideas. Most of the teaching ideas are fairly basic, addressing common-core standards. This doesn’t represent the best of all Egyptian literature in translation freely available online — although there are some excellent pieces, including poetry by Iman Mersal. But it does represent the best teaching resource for translated Arabic literature freely available online. In particular, middle- and high-school teachers can find help to introduce translated stories, graphic novels, and poetry into their classrooms, perhaps for the first time.